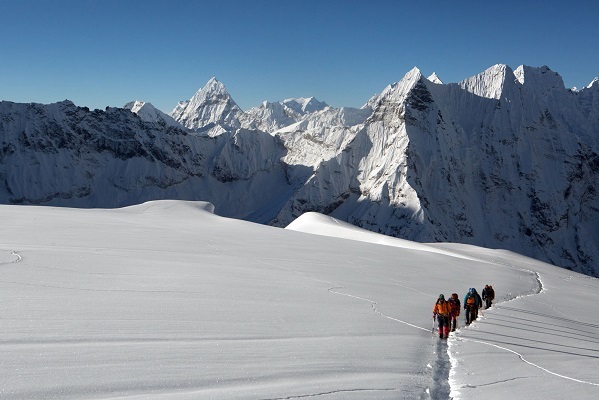 Island peak Trekking and expedition is a great first Himalayan experience that includes glacier travel, moderate snow and ice climbing while ascending 20,000+ feet mountain. Nepal is a country of friendly people, magnificent scenery, and a variety of cultural traditions. 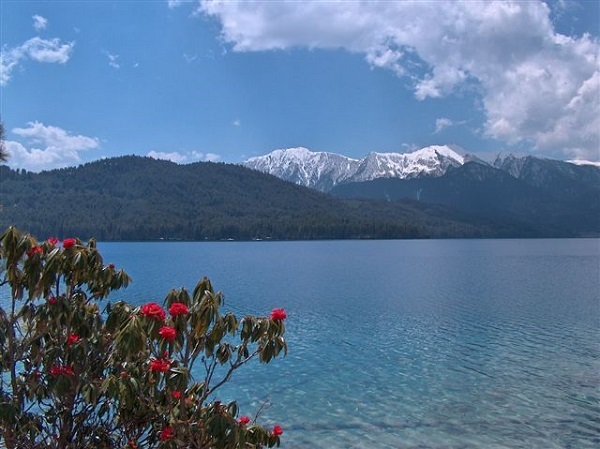 This blend of outdoor adventure and cultural exploration is a great way to experience the Himalayan Mountains – the world’s most impressive mountain range – and is sure to create lasting memories and provide you with a satisfying sense of accomplishment. After arriving, you have a day to practice rock climbing in Kathmandu or an optionally explore the vibrant city of Kathmandu before flying into the remote mountain terrain of Lukla village where you begin your trekking into the Khumbu region of the Himalaya. Situated at an elevation of 2,852 meters, the views of the Himalaya from Lukla on a clear day are breathtaking. Once there, we follow an ancient route that journeys through tiny villages, across high mountain passes, and through the remote valleys. Along the way, we visit Buddhist monasteries and begin to appreciate the unique mountain culture found in the Himalayan foothills. The views grow more spectacular as we venture up the Dudh Kosi River to Namche Bazaar – the gateway to the Khumbu region at 3,440 meters. We spend a night next few days to Gokyo valley, where you are rewarded with spectacular views of 5 Glacier lakes, spectacular view from Gokyo Ri (5,330m) with Ama Dablam, Mt.Lhotse, mount Cho Oyu, mt.Makalu, Mt. Nupse and other trekking peaks including Mount Everest. We cross the extreme Cho La pass(5,367m/17,604ft), hike to Everest base camp and then a rewarding hike leads to the summit of 5,550 meters at Kala Pattar and provides a truly spectacular panorama of Sagarmatha (Mt Everest), the Mother Goddess of the World (8,848 meters/29,028 feet), and Lhotse (27,560 feet).After trek to Everest base camp & Kala pattar our journey continues to Imja Tse (Island peak), tops out at 6,189 meters/20,305 feet and rewards us with magnificent views of Ama Dablam, South Face of Lhotse. From the summit of Island Peak there are stunning views of Mt. Lhotse and Mt. Makalu, the 4th and 5th highest mountains in the world, respectively. The return trek continues to delight adventurous souls with more spectacular mountain views, lush forested valleys, and opportunities to learn about the Nepalese religion and culture. Be assured that you have excellent himalayan adventure with us. We cross the extreme Cho La pass(5,367m/17,604ft), hike to Everest base camp and then a rewarding hike leads to the summit of 5,550 meters at Kala Pattar and provides a truly spectacular panorama of Sagarmatha (Mt Everest), the Mother Goddess of the World (8,848 meters/29,028 feet), and Lhotse (27,560 feet).After trek to Everest base camp & Kala pattar our journey continues to Imja Tse (Island peak), tops out at 6,189 meters/20,305 feet and rewards us with magnificent views of Ama Dablam, South Face of Lhotse. From the summit of Island Peak there are stunning views of Mt. Lhotse and Mt. Makalu, the 4th and 5th highest mountains in the world, respectively. Day 6 - Acclimatization day at Namche Bazaar. Today is your arrival day. We welcome you upon your arrival at Kathmandu’s Tribhuvan International Airport and transfer to Hotel in Kathmandu or your choice of Hotel anywhere in Kathmandu Valley (Kathmandu, Patan and Bhaktapur). 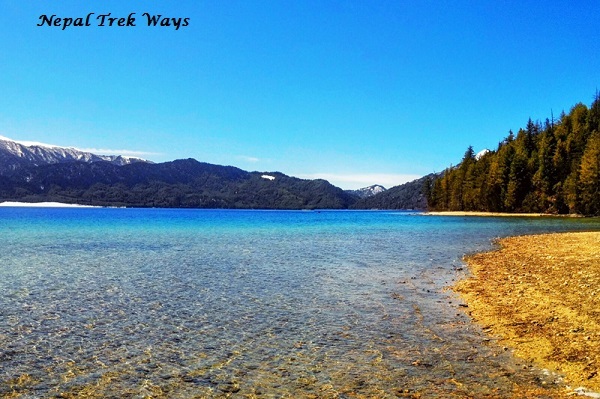 After hotel check in, a short briefing follow about your tour and trek program ahead. Depending upon your arrival time you may spend free time visiting nearby historic/countryside areas or resting. Half day sightseeing in Kathmandu World Heritage sites wherein your guide accompanies you on a tour of UNESCO enlisted temples and palaces that boast a unique fusion of Newari architecture, Hinduism and Buddhism. There is enough time to explore the city’s major places of interest with a cultural expert. Our Trek Leader/Guide meets you in the afternoon for trek briefing and for the final trek preparation. In the evening sample a delicious traditional Nepali welcome dinner in an authentic Nepali Restaurant with cultural dances. Private vehicle is there for you to pick up from and drop in your Hotel Yak & Yeti with bed and breakfast facilities. Overnight in Kathmandu. We transfer you to Balaju (half an hour drive from Hotel), a natural rock climbing spot for your climbing course before departure to Lukla. This course provides you an excellent opportunity to learn how to use rope, harness, Ice axe, crampons that keeps you physically and mentally prepared. After this, you have still time to take a world heritage sightseeing in 3 places inside Kathmandu valley. After return we’ll brief about trip and group meeting at office or in Hotel. Overnight in Kathmandu. 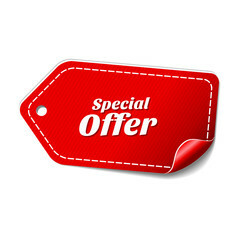 Accommodation in Hotel Yak & Yeti with in BB service. Early morning you’ll be transferred to domestic airport to fly to Lukla (2,800m/9,186ft). It a 35 minutes scenic flight to Lukla airport (2,800m/9,184ft).You have tea break, while the guide sort out and divide the loads of baggages to be carried by porters in Lukla. Your guide manages the lunch place depending upon the time of arrival at Lukla. The trek starts with most scenic view of Numbur Himal & Phari. We pace on to Phakding passing some Sherpa farm villages. We follow the trail to Dudhkoshi River with gradual up to Thado Koshi, where you can have a lunch with superb view of Kusum-Kangaru (6,369m/20,890ft) crossing a short suspension bridge, from here after a short climb brings us to the Ghat village, another 1 ½ hr of gradual walk brings you to Phakding village for the overnight stop at lodge after 3-4 hrs walk.In the free time stroll around the village for local experience, read, rest or playing cards with the group members. Overnight in Tea house with B, L & D service. We embark today’s hike in the morning. After crossing the suspension bridge over the Dudh-Koshi, the walk is pleasant with few short uphill and downhill and re-crossing the same River again with magnificent view of Mt. Thamserku (6,608m/21,675ft) from the Benkar village. Trek continues crossing the bridges and reaches at Monjo where there is the entrance gate for the Sagarmatha National Park. Your trekking permit is checked and recorded. Entering the National park boundary, we descend gradually that brings us to the suspension bridge over the Bhote-Koshi River, after the bridge Jorsalle village is reached, the last village till Namche Bazaar, from here the walk is pleasant on the River bed till the last bridge over the Imjatse River is reached, from here the walk is along the winding uphill path all the way to Namche Bazaar, with magnificent view of Kwangde peak and it other sister peaks towards east with Kusum kangaru on the back as you climb higher, view of Mt. Everest, Lhotse and the closer view of Tawache peak can be seen from some part on the way to Namche. Finally we reach at colorful houses called Namche Bazzar main gate of Khumbu region after 5-6 hrs walk. Overnight stay at Lodge with B, L & D services. Firstly, we climb to the scenic ridge above the Dole and the trail climbs via Lhabarma at 4220m to Luza at 4360m. The path is steep in most places as it climbs through scrub to Lhabarma. The trail continues to climb along the side of the valley high above the River, crossing sandy spurs to reach Machharmo at 4410m. It was in Machharmo in 1974 that one of the first Yeti sightings was reported in Khumbu. There are few good condition hotels and good mountain views from Machharmo and it takes 3-4 hrs walk. Afternoon after reaches and refreshed visit Himalayan rescue association and overnight at the hotel. Early morning our journey continue steep climb to the top after 2 hour walk on our pace. After reaching the top, you feel beaming as you achieve the moment that you been dreaming, since the beginning of the journey. Top of Kalapathar is a small rocky peak on the southwest ridge of Mt. Pumori, the view from here is beyond imagination as the Everest looks amazing, the panoramic view from this spot is something to cherish, and you feel its worth the hard climb up to here and to feel at the top of the world, and can be seen to the south Khumbu glacier sweeps below you, and you can also see the Everest Base camp down below on the moraine of Khumbu glacier and lot of picturesque scenery. Stroll back to Gorekshep and re-track to Dingboche for overnight stop at our teahouse after 6-7 hrs walk. Today, we have a very short day walk and after breakfast we head further eastern side to 2-3 hrs gentle up hill reach at Chhukung, which is a hidden valley near the base of Island peak. We’ll have full day rest at the Chhukung and last place to prepare the camping and check up climbing gear and overnight at teahouse. Today, we head further on to our journey with steep way climbing southern part then turning east to the main line of the valley. It then winds along or below the southern flank of the moraine from the Lhotse Glacier. Continue short pleasant walking along a streamside leads to what we call “Big -rock. The route to the Amphu Lapcha lies to the southeast. We cross route through the Imja and Lhotse glacier moraines leads to a wide valley flanking the SW side of Island peak. We’ll reach at Island peak base camp after 4-5 hrs walk and overnight at tented camp. After breakfast , we’ll head on to the High camp from where we start our climb. Firstly the path leads up beyond base camp for several hundred meters before striking off left up the steep hillside. Initially sandy, the path soon turns to grass before becoming boulder strewn. As you climb the hill, you see that the slope narrows and the path enter a steep rock channel nearby where we’ll overnight at tented camp. Today, day of our destination and as start our climb early morning through the rock gully. This is not difficult but there are several short rock steps to climb before you emerge on the right side of the gully. The route then follows a ridgeline, which leads to an exhilarating and exposed traverse onto the snout of the summit glacier. You need to rope up for the glacier as it contains several crevasses but it leads without difficulty, to a 100m/330ft snow and ice slope (40-45º) on which the guides fix a rope. From the top of this slope, 3 rope lengths along a sharp summit ridge lead to the top. You can enjoy with success and brave to get a summit and after some picture taking of scenic view descend all the way to Chhukung for overnight at teahouse and it takes full day as 9-10 hrs climbing & walk. We must keep this extra day for the unforeseen condition as weather problem or weaknessl. We can take this day as a reserve day and if earlier back then you can take the rest somewhere else around. This day may stay at camp or teahouse base on the condition. The walk today be easy heading downhill to a lower elevation from Chhukung the walk is pleasant and all the way to Tyangboche. After the Dingboche valley and getting down to bridge our route descends following the stream towards Pangboche village, and further down to Tyangboche is one of the most beautiful place in the Himalaya the first thing that comes to your eye is the big Monastery or Gumba, then the large field with campsites and teahouses, lodges beneath the towering majestic beautiful peak Ama Dablam, Everest, Mt. Lhotse and Lhotse Shar towards north east and more peaks all around you. Trek down to Phungithanka a small settlement with couple of teahouses. The trail leads down hill through the forested path of silver fir, blue pines, rhododendron and some few magnolia and birch trees and with a great memories and after crossing the suspension bridge over the Dudh Koshi River trek onwards to the Sanasa and retrack to Namche bazzar for the overnight stay. (Breakfast, Lunch, Dinner & teahouse/tent accommodation included). After a long walk today we’ll have long and last day trek back to Lukla, Firstly we descend the long way before crossing the bridge and further walk to Monju and then to Phakding. Departure Kathmandu. We pick you to drop at international airport. We expect to see you again in Nepal for adventure trekking and tour. 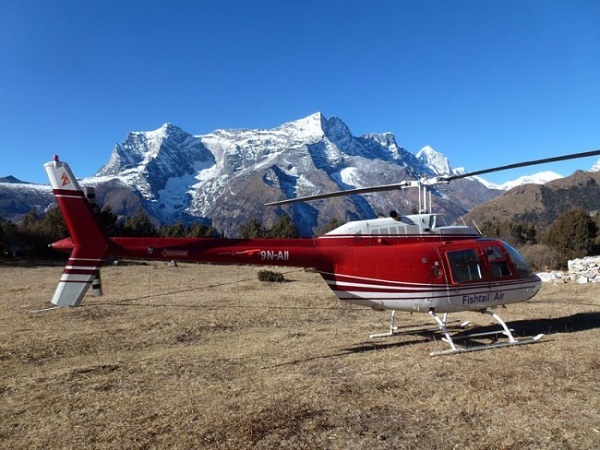 Helicopter tour in Annapurna Base Camp could be your legendary holiday tour in Nepal.Take a bird's eye view of mysterious Annapurna Sanctuary. It is a very ideal tour for mountainous landscape photography!